EddieCPollard (Raleigh): It is the second best book I have ever read with the Bible being the first! Local Press. hardcover. New. Ship out in 2 business day, And Fast shipping, Free Tracking number will be provided after the shipment.Hardcover . Publisher: Local out Satisfaction guaranteed,or money back. Zondervan, 2003-09-30. Leather Bound. Used:Good. U.S.A.: Zondervan, 2002. First edition, first printing indicated by a full number line 10-1 and an original jacket containing no "best-selling" or "campaign edition" logos or banners. Very good clean tight copy. Text DOES contain some neat pencil underlining marks on about 40 pages. Professional book dealer with storefront since 1999. All orders are processed promptly and carefully packaged.. First Edition - First Printing.. Hard Cover. Very Good/Very Good. Edition: First Edition - First Printing. 2012-07-09. New. Ships with Tracking Number! INTERNATIONAL WORLDWIDE Shipping available. Buy with confidence, excellent customer service! 2003-07-06. New. Ships with Tracking Number! INTERNATIONAL WORLDWIDE Shipping available. Buy with confidence, excellent customer service! 2004-01-05. New. Ships with Tracking Number! INTERNATIONAL WORLDWIDE Shipping available. Buy with confidence, excellent customer service! Zondervan. Used - Very Good. Very Good condition. Like New dust jacket. Owner's name on inside. 2017-06-20. Good. Ships with Tracking Number! INTERNATIONAL WORLDWIDE Shipping available. May not contain Access Codes or Supplements. May be ex-library. Shipping & Handling by region. Buy with confidence, excellent customer service! 2017-06-20. New. Ships with Tracking Number! INTERNATIONAL WORLDWIDE Shipping available. Buy with confidence, excellent customer service! 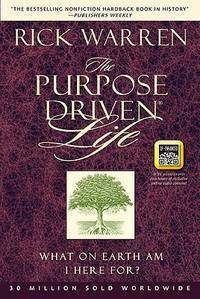 The Purpose Driven Life (QR Code Enhanced Edition): What on Earth Am I Here For? 2011-09-02. New. Ships with Tracking Number! INTERNATIONAL WORLDWIDE Shipping available. Buy with confidence, excellent customer service! 2012-06-05. New. Ships with Tracking Number! INTERNATIONAL WORLDWIDE Shipping available. Buy with confidence, excellent customer service! 2003-05-02. New. Ships with Tracking Number! INTERNATIONAL WORLDWIDE Shipping available. Buy with confidence, excellent customer service! Easton Press. LEATHER_BOUND. Still in manufacturer's plastic. Rich maroon leather with gilded pages and golden inlay. 100% of proceeds go to promoting literacy in under-served areas of the world. . Fine. Norwalk, CT: Easton Press. Fine. 2005. Full-Leather. Fine full leather edition, no names or bookplates. ; 8vo 8" - 9" tall; 334 pages . Easton Press. Near Fine with no dust jacket. 2005. Collector's Edition. Full Leather. Very slightest of edgewear; burgundy leather w/gilt page ends, moire endpapers, silk ribbon bookmark; 334 pages . Grand Rapids, Michigan: Zondervan. 2005. First Edition; First Printing. Hardcover. 0310601940 . Very Good+ in a Very Good+ case. Front panel shows scuffing towards lower edge. Original casing shows edge wear. ; 9.70 X 6.40 X 1.30 inches; 336 pages . Zondervan, 2016. Leather / fine bindi. New. 8.23 x 5.47 cm. Zondervan Publishing House. MASS MARKET PAPERBACK. 0310264138 New Condition. . New. Zondervan. LEATHER BOUND. 0310255651 New Condition. . New. OMF Literature Inc.. PAPERBACK. 9715117783 New Condition. . New. Zondervan. PAPERBACK. 0310335507 New Condition. . New. Zondervan. PAPERBACK. 8938810615 New Condition. . New. ZONDERVAN. PAPERBACK. 0310210747 New Condition. . New. Zondervan. MASS MARKET PAPERBACK. 0310275385 New Condition. . New. Zondervan. Hardcover. 0310205719 New Condition. . New. Zondervan. PAPERBACK. 0310255252 New Condition. . New. Zondervan. PAPERBACK. B005HKNNZ2 New Condition. . New. Inspirio. Hardcover. 0310806356 New Condition. . New. Grand Rapids, MI: Zondervan. 2002. Forty-First Printing. Hardcover. 0310205719 . Near Fine in a Very Good+ dust jacket. Upward peeling to front panel's lower edge. ; 9.10 X 6.20 X 1.30 inches; 334 pages; Original unclipped dust jacket protected by archival Brodart cover. All domestic orders shipped protected in a Box. .
2002-06-09. Good. Ships with Tracking Number! INTERNATIONAL WORLDWIDE Shipping available. May not contain Access Codes or Supplements. May be ex-library. Shipping & Handling by region. Buy with confidence, excellent customer service! 2011-09-02. Good. Ships with Tracking Number! INTERNATIONAL WORLDWIDE Shipping available. May not contain Access Codes or Supplements. May be ex-library. Shipping & Handling by region. Buy with confidence, excellent customer service!